Hello. I have a problem with Chimera. I try different builds, different combinations of Halo custom edition 1.10 and HAC2, OS, etc. With mods, without mods - always one result - after I start game "gathering exeption data" and game just closed without any logs. What I do wrong? Can someone help? I use Win7 x64 and Halo CE 1.10. If you're using build 33, there's a crashing bug with that version. I'd use build 32. I'm working on build 34 which fixes this problem and adds numerous other features. I try even Build 25. Same result. I really don't know what is wrong. I did'nt even see main menu. Only loading sccreen and then - crash. I try even Build 25. Same result. I really don't know what is worng. I did'nt even see main menu. Only loading sccreen and then - crash. Sounds like a similar bug a few other people reported to me a long time ago. This was something I had actually fixed a while back. Yay! This build works! Thank you. Hope see next stable build soon. I've been working on making chimera_interpolate run better on slower PCs, and I've made some improvements. If you compare this graph to the last graph, the frame rates are different That's partly because I'm running the game in 1080p windowed now, and also partly because I have settings like chimera_block_lod turned on. Anyway, if you compare the High settings between both graphs, I've cut the performance loss in half. Also, the setting is a bit more granular and goes from 0 to 9 instead of 0 to 3, though inputting "low", "medium", etc. will give you that setting as well. There's also now a distance check that will reduce interpolation if the object is far enough away from the camera, but this distance check is disabled in the highest setting. If you look at the difference between 9 and 8, the distance check optimization provides a pretty measurable improvement. In most cases, it should look the same, but if you play the game at 1080p or higher, you may be able to spot some differences with more complex objects that are farther away if you look carefully. Off - No interpolation is present. Low - Bipeds and vehicles get rotation interpolation. Equipment gets position interpolation so it won't look funky if other players move. Machines and device controls get position interpolation as well, allowing doors to appear smooth when opening and closing. Medium - All objects get rotation interpolation except for scenery and projectiles. Particles are interpolated. High - All objects get rotation interpolation. Ultra - All objects get rotation interpolation, but the distance check optimization is disabled. If you're using build 32, it's not in there. If you're using build 33, it's there, though it's not very stable and does not resemble what it'll be like in build 34 (hence why build 33 is marked as "unstable"). Build 34 will have the next revision which will have both rotation and location interpolation, and I'm planning on releasing it very soon. I didn't get a dll file, i got a 7Z file called "Chimera_build_32.7z"
- chimera_auto_stfu            - Say /stfu upon joining. - chimera_block_lod            - Render all objects at their highest LOD regardless of your distance. - chimera_throttle_fps         - Throttle your frame rate without enabling vSync. 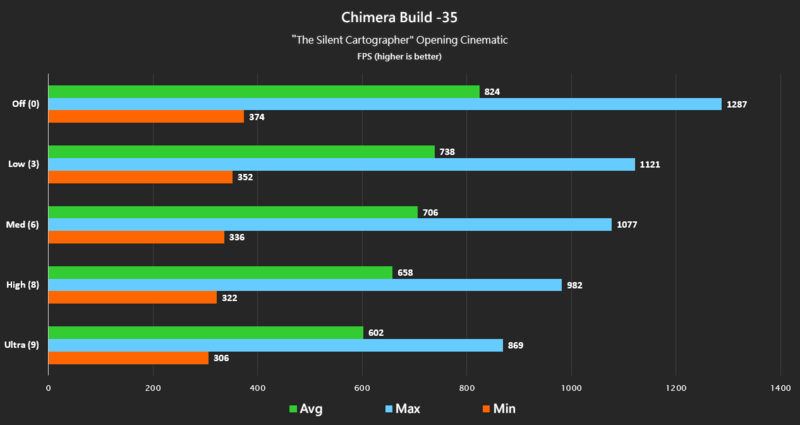 - chimera_uncap_cinematic      - Disable the 30 FPS cap in cinematics. - chimera_auto_uncrouch        - Enable automatic uncrouching a la Xbox when moving at full speed while crouching (enabled by default). - chimera_block_mouse          - Disable switching to the mouse. - chimera_deadzone_looking     - Set the deadzone for your controller. + chimera_deadzone_looking_zoom_scale can be used to change your deadzone when zoomed in. - chimera_player_coords        - Actively show you your coordinates as you move. - chimera_tps                  - Set the tick rate of Halo. + ...now has 10 settings (0-9) with higher settings having more interpolation (and more CPU usage). + ...can now interpolate rotation of objects for extra smoothness. + ...is now multithreaded (can be made single-threaded with chimera_single_core_interpolation). - Console text colors have been added. + General text is white. - Deadzones now work in multiplayer servers. - A few crashing issues were fixed. - The Discord overlay should no longer crash Halo when Chimera is loaded.